Prescription costs are one of the fastest growing expenses in health care, and they can take a bite out of your budget. Prescription drug coverage is different for every Florida Blue health plan. One way insurance companies try to keep drug costs more affordable for you is through a formulary and drug tiers. So, what are these and what do they mean for you? A formulary is a list of medications that are covered by your plan. This list is created by doctors and pharmacists who research drugs to make sure they’re safe, effective and provide the best overall value. Plans negotiate discounted prices for the drugs in their formulary, develop a network of preferred pharmacies which may offer lower prices, and offer home delivery to fill maintenance drugs at a lower out-of-pocket cost for you. You can find your list of covered drugs here or log onto your member account. Within the formulary, drugs are placed into different levels, called tiers, by the type of drug. The tier lets you know how much your health plan will pay for that particular drug. Some health plans might have as many as seven tiers—it varies from one health insurance company to another. Why do we have tiers? The purpose of a tier system is to encourage use of lower-cost, generic drugs, which work identical to their brand-name counterparts. What are the drug tiers? 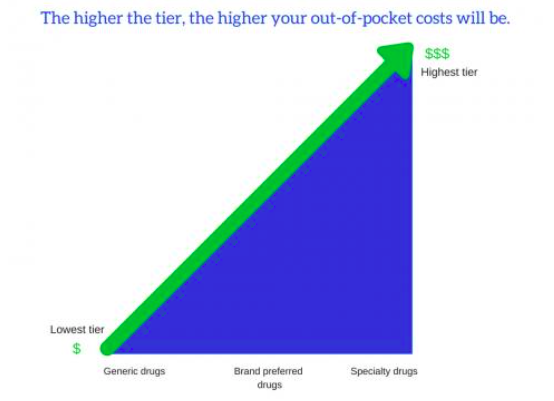 Generics generally fall into the lowest tiers with the lowest out-of-pocket cost. Many insurance companies also have brand-name drugs on their formulary. These brand drugs are often divided into two categories, preferred and non-preferred depending on the safety, quality and performance characteristics. The highest tiers generally contain specialty drugs. These drugs, which require special handling, are high-cost prescription drugs used to treat complex or rare conditions like cancer, rheumatoid arthritis and multiple sclerosis. How can I save on my drug costs? First, check the list of drugs covered by your plan by logging onto your member account. You can also compare drug prices between selected pharmacies in your area to find the lowest cost for your medications, find generic alternatives and refill home delivery prescriptions. Log in and select Compare Drug Prices under Tools or Click Here. Then your doctor and pharmacist can help suggest the options that can effectively treat your condition at the lowest possible cost. Which Drugs are Covered by Your Plan? Your medication guide lists all the drugs that are covered by your plan. You can find it by logging in to your account at floridablue.com and clicking My Plan, then Pharmacy. Which Pharmacies are in Your Network? You’ll save money by choosing pharmacies in your plan’s network. To find a pharmacy, log in to your account and go to Find Doctors, Pharmacies and More, then click Go. Then, use the dropdown arrow next to Provider Type to choose Pharmacy. Want to learn more? Check out more information about saving money. 1IMS Institute for Healthcare Informatics. (2012, February). Healthcare Spending Among Privately Insured Individuals Under Age 65.